This Five Oceans multi-purpose folding chairs are lightweight, strong and comfortable. The frame is built of 1" diameter corrosion-resistant aluminum and has a back crossbar for stability. Features varnished hardwood armrests, and nonskid chair tips protect your deck from scratches and scuffs. Not to mention, constructed of a mildew-resistant fabric that provides superior fade resistance. With a rich navy color, compass pattern design in the backrest, and right side cup holder. 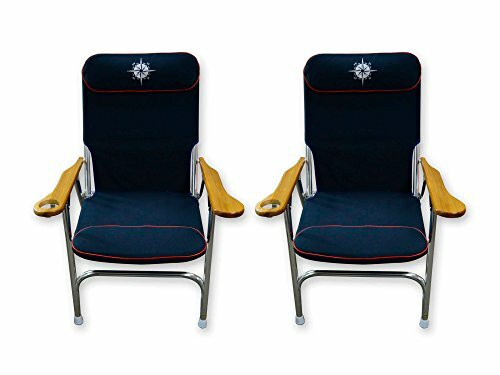 These chairs are perfect for ether the boat deck or the back yard!